The Jets can no longer make the playoffs and the Giants do not control their own destiny, but the Knicks lead the East. Less than a minute into the opening quarter of Sunday’s game against the Falcons, Eli Manning was picked off on the first pass of the day. One would think, after Atlanta quickly converted that interception into a touchdown, the Giants would have nowhere to go but up, but the day did not get any prettier for fans in New York. The Giants flat lined. Atlanta quickly piled on a second touchdown, then a field goal in the second quarter. Lawrence Tynes had a chance to put Big Blue on the scoreboard early in the first, but missed from only 30 yards out. When the Giants returned to field goal range at the end of the half, they instead opted to go for it on 4th and 2; Manning missed a connection to Cruz, and the Giants went into the locker room down 17-0. Atlanta put up another 10 in the third quarter and 7 in the fourth. Eli went a mere 13/25 for 161 yards with no TD’s and 2 interceptions. The running game was no more effective as Wilson ran for 25 on 12 carries and Lumpkin went for 22 on 9 (Bradshaw was out with an injury). The G-Men’s defense helped little as they failed to sack Matt Ryan once (he went 23/28 for 270 yards and 3 TD’s) while the Falcons cruised to a 34-0 victory. 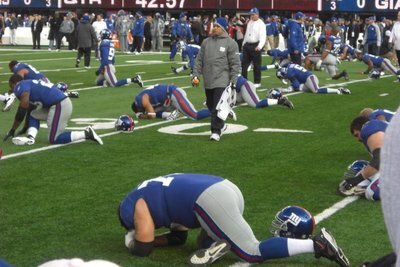 This marks the first time the Giants have been shut out since a 23-0 loss to Carolina during the 2005 playoffs and 24-0 defeat by Philadelphia in the 1996 regular season. Now 8-6, the defending Super Bowl Champs are in a 3 way tie for first in the NFC East, but the Redskins hold the tiebreaker. If New York cannot pull ahead of their division rivals, they may fail to make the playoffs. They face a stiff challenge in the form of Baltimore at 4:25 on Sunday. It has been a rough season for Jets fans. There has been much squabbling over which of their three quarterbacks should be the starter, but none of them have done very much to make that decision easy. Despite poor play at every level of the game throughout the year, the Jets still had a glimmer of hope for a playoff berth entering Monday’s game against the Titans. They even got off to an early 3-0 lead in the first quarter, and came back from a 7-3 halftime deficit (which resulted from a 94 yard Chris Johnson run) with a touchdown in the third. The Titans responded with a second TD of their own, leaving the scoreboard at 14-10 entering the final quarter. Gang Green failed to convert any of their possessions into a scoring drive, but managed to stave off of Tennessee all the same. With only a few minutes left in the game, Sanchez made a poorly thought out toss to the end zone and was picked off; it was one of four for him on the night. Still, New York’s defense came through once more—not only forcing a three and out, but also putting enough pressure on the Titan’s punter to make him shank the ball to the 25 yard line. With only a quarter of the field to cover and plenty of time left to move the ball, Sanchez dropped a low snap. The ball was booted then recovered by Tennessee, and that was game. So ends the Jets’ playoff hopes. The same sloppy, poorly conducted, almost senseless play that characterized their whole season brought it to a close. Mark went 13/28 for 131 yards and a TD. If not for the 4 picks his line score would have looked marginally better than the Titans’ Locker (and Tebow’s 0/1 with 15 rushing yards, for that matter), but his misplaced throws spelled doom for Gang Green. After the game, Rex Ryan finally wavered from towing the Sanchez line, stating he was unsure who would start next Sunday’s 1 o’clock game against the Chargers. In the Knicks second trip to Brooklyn, the Nets were without star center Brook Lopez, but New York’s Carmelo Anthony had returned from a lacerated finger. The variance in star power was evident throughout the night. While Johnson, Wallace, Williams, and Blatche put up 16, 17, 18, and 23 respectively, the Knicks’ scoring was much more lopsided. Smith and Kidd scored 16 and 18, but nearly half of the Knicks’ offense came from Anthony in the form of a 45 point night. Only three other players from New York made so much as a single shot, however, the combined 21 points between Chandler (5), Felton (8), and Wallace (8) was enough to put the Knicks over the Nets 100-97. After their game against Brooklyn, the Knicks went on to defeat the Lakers in the first matchup since their former coach, Mike D’Antoni, took command of LA by a score of 116-107. A late-game rally by the Lakers made the game interesting, but the Knicks were dominant for most the night. They followed the victory up with a fourth straight win, this time against Cleveland. Anthony sat the night out with a sprained ankle, but New York still squeaked by 103-102. He sat out again last night, as Jeremy Lin returned to MSG for the first time since moving to Houston. Lin’s 22 Points helped put the Knicks away, 109-96. Meanwhile, the Nets defeated Toronto 94-88 to end a 5-game losing streak which coincided with Lopez’s absence. He returned to the Barclay’s center when Detroit came to town and, though he only had 4 rebounds and 9 points, the Nets won 107-105. His production ramped up against the Bulls, putting together 10 rebounds and 18 points, but Brooklyn fell 82-83. The Nets, now 13-10, host Utah at 7:30 tonight. The Knicks, an Eastern conference best 18-6, will host Brooklyn for their third matchup at 7 PM tomorrow. Subject: LongIsland.com - Your Name sent you Article details of "Knicks Keep Winning, but Jets and Giants Falter"